Hidden in the bowels of Freddy Fazbear's Pizzeria is the backstage workshop where animatronics are either fixed with fresh new parts or left to lurk in disrepair. 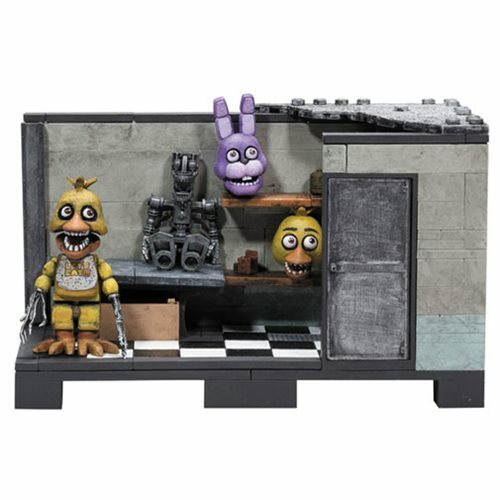 The Five Nights at Freddy's Backstage Medium Construction Set includes a Withered Chica figure and 153 pieces. The Five Nights at Freddy's Backstage Medium Construction Set features spare parts, an endoskeleton and a collection of spare animatronic heads. Contains Withered Chica and Endoskeleton figures. Figures feature articulation in the main joints and have swappable heads/limbs. The updated packaging includes large window box to show off figure. Figures and bricks are compatible with other construction brands. Classic series allows new fans to collect the original Five Nights at Freddy's sets.